Maia: Nothing�s over. It�s just starting. Diana: Sweetie, what are you talking about? What's starting? Picking up one year after the events of the original mini-series, the full second season of the USA Network's sci-fi outing, The 4400 continues exploring a potentially rich case of us vs. them paranoia, sprinkled with governmental conspiracy and pseudo-religious trappings. The number in the title refers to a group of random people who disappeared over the past one hundred years or so, and who returned all at once in a big ball of light in the Pacific Northwest. None of them had aged one bit, and nor were they particularly sure who took them or where they had been, and to make things even more interesting, apparently each returnee has been imbued with some special power, though the purpose of those powers is sometimes unclear. 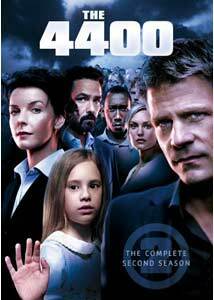 The public is suspicious of the so-called "4400s", and while the obvious X-Men/mutant comparisons are in order, the reality here is that the 4400s themselves are not always so enamored of their own uniqueness, or do they know what to do with it. The big first season reveal that the mysterious abductors were humans from the future attempting quell some potential catastrophic Earth crisis by sending back a batch of altered people seemed to channel things in an interesting direction, though it would have been nice if these future types could have spelled things out a little more clearly. With the second season we get the return of the principal characters, including the Mulder/Scully-lite investigators Tom Baldwin and Diana Skouris (Joel Gretsch, Jacqueline McKenzie) of The National Threat Assessment Command, as well as a smattering of 4400 returnees, such as the interracial couple Richard and Lily (Mahershalalhashbaz Ali, Laura Allen) with as of yet no special powers except for their future human hybrid baby; cocky teenager Shawn, who has the ability to heal (Patrick Flueger); and Maia, a young girl who knows the future (Conchita Campbell). There's also the wealthy and mysterious Jordan Collier (Bill Campbell), a guy with a messianic complex who establishes the clearly titled 4400 Center, which becomes a cross between a cult and safe house for the disenfranchised to "discover the 4400 within themselves." Things move along well for the first five episodes as Collier ratchets up his role as villain, and includes appearances by Jeffrey Combs and Summer Glau as eerily demented types somehow involved in the construction of a Rube Goldberg "communication device" at a psych hospital, as well as having the Skouris character formally adopt Maia; the arrival of Skouris' sister (Natasha Gregson Wagner); and establishing that the baby of Richard and Lily may have some very dangerous powers. Episode six (Life Interrupted) is where the wheels start to come off the track a little, and it's as if the writers were suddenly told they needed to introduce a new character, and to make it Tom Baldwin's new wife (Karina Lombard). Seeing that this is a sci-fi show, the methodology to do this is there more so than if this were a standard drama, but the presentation relies on a flaky premise, at best. The sudden intro of the new character, despite a nice performance from Lombard, is sadly one of the first huge stumbling blocks that befell the inconsistent writing of the final six episodes of the season. Sure, a major character is killed off, and there's a stab at getting all apocalyptic and conspiratorial during the final block of shows, but the buildup falls short when it really could have become wonderfully dark. An unrecognizable Sherilyn Fenn as a very infectious 4400 in Carrier has the distinction of appearing in probably one of the best eps of the second season, one that does its best to deliver the promised wanton death and destruction. The buildup for the sweeping conspiracy comes with a fairly loose payoff that is something of a headscratcher, with the season ending installment (Mommy's Bosses) sets up the upcoming third season with a few curious twists that may prove to be equally troublesome. Even though the original mini-series was only five episodes, I was rather satisfied with the open-ended conclusion, and I wasn't necessarily clamoring for more resolution. The second season forced writers to reopen some closed storylines, and as is often the case, spreading the new and rejuvenated plots over thirteen episodes is perhaps a bit too much. A mid-season plot point is the biggest offender of laziness, and, as viewers, we're left with less answers and more stringing along to be resolved in Season Three. Image Transfer Review: All thirteen eps have been delivered in 1.78:1 anamorphic widescreen, and the presentation is actually very nicely done, with the show looking better here than it did during its original broadcasts. I was immediately aware of more definition and detail, especially during scenes with less than favorable lighting, and in general the richness of colors and hues of fleshtones seemed slightly more warm. The prints are clean, with no evidence of major compression or artifacting issues. Audio Transfer Review: There are two English language audio options for this set, in either Dolby Digital 5.1 or 2.0 surround. While I applaud the effort, the results are only average, as the 5.1 mix doesn't really rise up that much more than the 2.0 track. Differences are extremely minor between the two, with dialogue clarity and crispness appearing almost identical, with the only measurable improvement coming during the score elements. Music is moderately fuller with the 5.1, and that was the only time I felt any significant sense of depth. Neither tracks have any problems, it's just the 5.1 fails to achieve its potential. Extras Review: This four-disc set is contained in two thin Scanavo cases (two discs per case), inside of a cardboard slipcase. The backcovers of the cases have plot summaries and original air date info as well. A trio of commentaries�for the eps As Fate Would Have It, The Fifth Page and Mommy's Bosses�feature a couple of cast members (Jacqueline McKenzie, Joel Gretsch), a writer (Craig Sweeny) and an executive producer (Ira Steven Behr). The four appear together on all three tracks, and while none of the revelations are especially groundbreaking, their rapport is pleasant enough. And if for nothing else, it's curiously cool to hear Jacqueline McKenzie speak with her natural Aussie accent. Disc 4 contains a set of three short featurettes. Creating the Ball of Light (08m:48s) is oddly enough not about the creation of a particular visual effect, but rather an overall look at the show's origins from idea to mini-series. Return of The 4400 (11m:25s) tackles the storyline reinvention needed when the second season was announced, and one writer describes it as a "reboot" of sorts. A Stitch in Time (09m:40s) attempts to loosely quantify the time travel elements proposed in the series with actual science. Each episode is cut into nine chapters. I was a faithful viewer of the mini-series and the second season, and during this block of thirteen episodes I just feel things too often fall into the realm of sloppy TV, in this case no doubt a partial handcuff due to budget constraints. Still, the writing quality fluctuated wildly, and the promise of a properly apocalyptic climax is only hinted at, which comes as something of a disappointment. A few individual standout eps and storylines almost redeem this Season Two set, but overall the payoff only serves to lead into the upcoming season.